Harrisburg, PA – Less than a year after its creation, Governor Tom Wolf today announced that the administration’s initiative to provide motorists with information during long-term road closures, 511PAConnect, has earned several regional and international transportation awards. 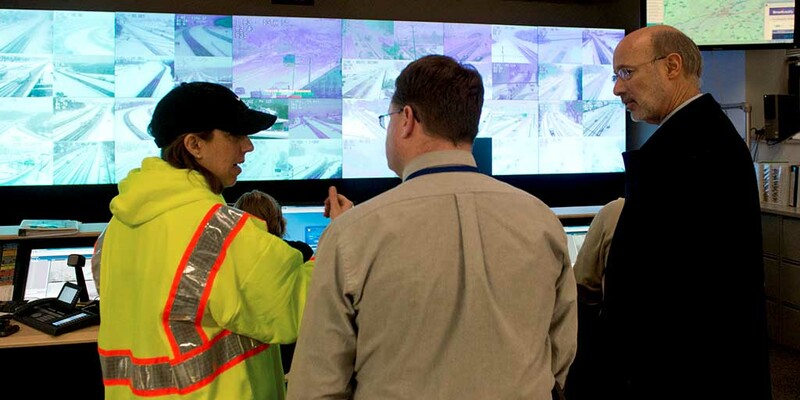 Through 511PAConnect, personnel from the Pennsylvania Department of Transportation and the PA Turnpike identify a potential long-term closure and notify staff at the 24-hour Commonwealth Watch and Warning Center at the PA Emergency Management Agency, who issue an initial location-based alert to motorists in the area of the closure. Law enforcement also uses the alerting system to issue Amber Alerts for missing children. Motorists who receive the alert have the option of registering for automatic text messages or phone call updates. Follow-up notifications are generated by Turnpike and PennDOT staff monitoring the closure. Once the incident is resolved, motorists who registered for the alerts are automatically unsubscribed and all personal data is scrubbed from the system. PennDOT and the Turnpike offer a variety of tools to keep travelers informed during all levels of incidents — including the 511PA smartphone app, phone number, online sources and social media platforms — but 511PAConnect was the first initiative of its kind to link directly to a targeted group of travelers who are being impacted by, or who are approaching, a large-scale emergency. Since the service was launched, PennDOT and the PA Turnpike used it a combined five times from December 2016 through March 2017. During four incidents, an average of 77 people opted in for follow-up incident messaging over an average of 222 minutes. The system was also activated to inform travelers of a planned exit closure in January.